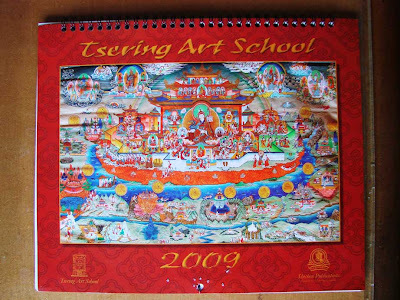 Tsering Art School of the Shechen Monestary in Kathmandu publishes an annual calendar of thangka. 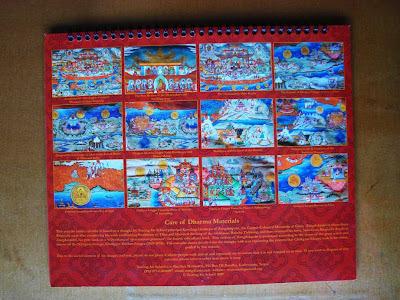 Typically each month features a reproduction of a thangka by one of its students, printed on heavy gloss and featuring all the most important Tibetan holidays. This year the calendar is doing something a little different. It features only one painting and 11 detail photographs of a large canvas by the Tsering Art School Principal Konchog Lhadrepa. The thangka depicts Zangdokpalri, the Copper Coloured Mountain of Guru Rinpoche and narrates the magical journey of the great Terton Chokgyur Lingpa to that pure land. One of our students is currently working on a copy of this very painting. 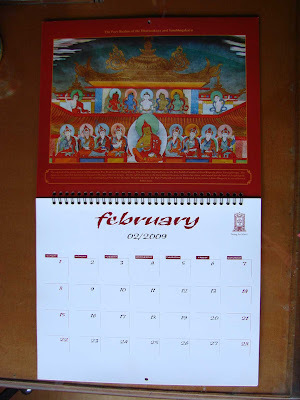 I had a chance to see the calendar this week and it is quite a lovely product, especially for those interested in thangka. This year for some reason, however, Tibetan dates have not been included, as you can see in the photos. For those of you just tuning in, Tsering is the school where I study. You can order a copy directly from the school. Copies are also available from the Namse Bangdzo Bookstore in the USA.